The Newark climate history began in 1929. However, the Kennedy, Islip, and Bridgeport records did not begin until 1949, 1986, and 1948, respectively. At Central Park, where records began in 1869, the low of 38° at 6:37 am was well above the record of 33° in 1875. IN CONNECTICUT...FAIRFIELD...NEW HAVEN...MIDDLESEX...AND NEW LONDON. IN NEW JERSEY...PASSAIC...BERGEN...AND WESTERN ESSEX. Despite a cold outbreak in the central portion of the country, the U.S. heat streak has extended into its 43rd consecutive week. Preliminary area-adjusted data from the National Climatic Data Center (NCDC) for the week ending October 6, posted overnight, show that the contiguous 48-state average temperature was 0.1° above normal. This was the smallest positive margin since the streak began with the week ending December 17 of last year. In fact, the raw average of 215 major National Weather Service (NWS) stations was 0.3° below normal. Of the 9 climate regions, 4 were cooler than normal: East North-Central, Central, West North-Central, and South. The South was the coolest at -2.5°. However, the Northeast and West were each 5° or more warmer than average. The average contiguous U.S. temperature during September was 67.0°F, 1.4°F above the 20th century average, tying September 1980 as the 23rd warmest such month on record. 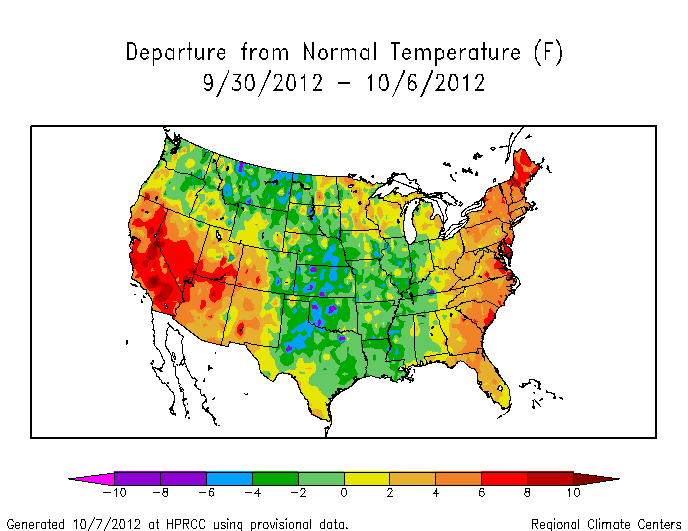 September 2012 marks the 16th consecutive month with above-average temperatures for the Lower 48. 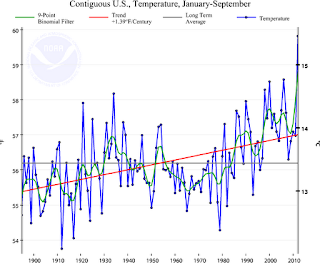 The contiguous U.S. warm season, defined as the six-month period from April-September, had temperatures that were record warm. 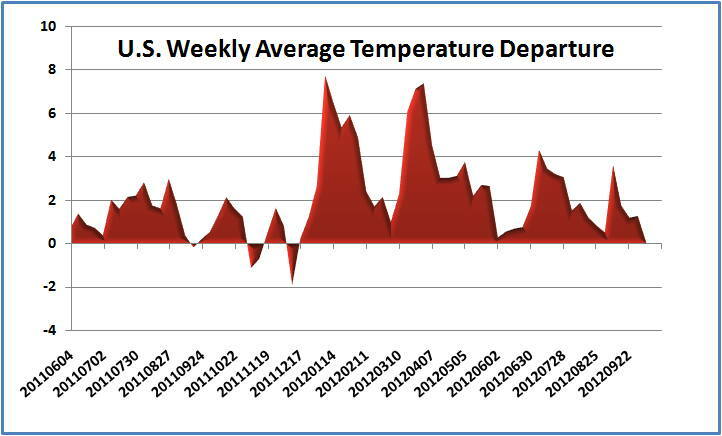 The six-month average temperature of 68.2°F for the Lower 48 was 2.6°F above average. The previous warmest April-September occurred in 1934 when the nationally-averaged temperature was 67.6°F. 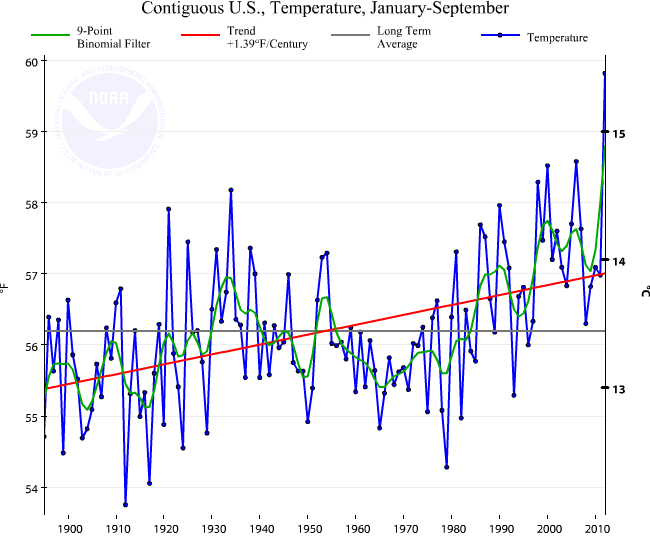 The January-September period was the warmest first nine months of any year on record for the contiguous United States. The national temperature of 59.8°F was 3.8°F above the 20th century average, and 1.2°F above the previous record warm January-September of 2006. During the nine-month period, 46 states had temperatures among their ten warmest, with 25 states being record warm. Only Washington had statewide temperatures near average for the period. The October 2011-September 2012 period was the warmest such 12-month period on record for the contiguous U.S., with an average temperature of 56.2°F, 3.2°F above average. This 12-month temperature average tied the June 2011-May 2012 period as the 3rd warmest of any 12-month period. The six warmest 12-month periods have all ended during 2012.